I admit...I'm not a big fan of cooked broccoli (love snacking on it raw), but when it comes to being cooked...well, I'm picky about it. Today's guest post recipe is courtesy of The Cocoa Exchange and looks like one that I might enjoy, especially since I'm a big fan of tomatoes. You'll only need 5 ingredients to make this recipe, so it's perfect for those who are learning how to cook. In a large sauté pan over medium heat, add olive oil and Pod & Bean™ Burger Seasoning. 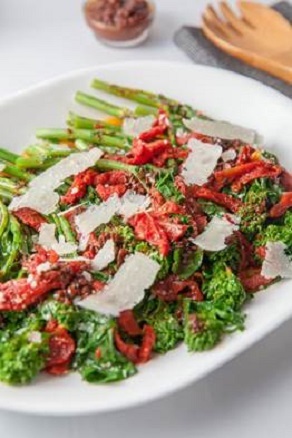 Add coarsely chopped broccoli rabe and sun-dried tomatoes and toss well. Cook for 5-6 minutes or until tender. Top with shredded parmesan cheese. I think that I would enjoy combining these ingredients to make a delicious vegetable dish. I want to use more broccoli rabe in cooking.